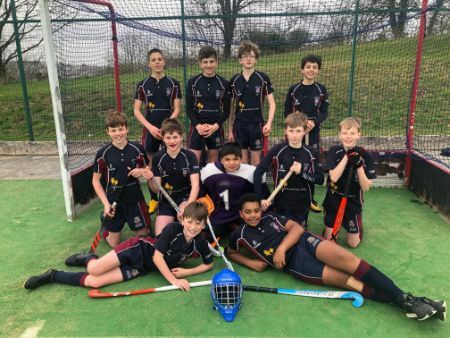 With 6 teams entered into the U13 Boys Hockey tournament, a round robin tournament took place. The tournament got under way, our 1st game was against Richard Lander, once we settled we played some fantastic passages of play, linking up well and transferring the ball around the back. We drove the ball forward and had a number opportunities but couldn't find the net. With only 5 minutes goal, we found a gap and a well worked set play finally paid of, goal number one scored. With only a couple of minutes left, a team effort and a well worked finish, we scored goal number 2. First game done and 3 points on the board. Going into our second game against Mounts Bay we knew this game was going to be the most challenging, with end to end play and the boys fighting for every ball it was all to play for. With 6 minutes to go the Truro lads stepped it up a gear and a well worked goal was awarded to Truro, nothing less than they deserved. Seconds left on the clock and Mounts Bay were awarded a short corner, but our boys were determined to keep the ball out and that's what they did. Another 3 points on the score board. We knew from beating Mounts Bay we were in the driving seat and in control to go on and win the tournament but had to maintain a calm approach and keep it together, a simple slip up and it could cost us. With 3 games left to play, we beat Penair, 1-0, Penrice was slightly more challenging but we got a result 2-1 and our final game beating Liskeard 2-0. With only one goal conceded all day and winning every game, Truro came out on top being crowned the County Champions. The boys were a delight throughout the day and there work rate was fantastic, i was extremely impressed. The boys now go on to represent Cornwall at the Regional's at Millfield on Thursday 21st March.